Today at the family service I asked all the children who were here to come up for the children’s sermon before this homily. And standing here on the chancel, I asked them to help me remember the Christmas story. And they stood here, fresh from their performances as angels with homemade wings and shepherds in bathrobes, and they told us the Christmas story. They told us about how Mary and Joseph went to Bethlehem, and they looked for a place to stay, but there was no room in the inn. And they told us about how that baby was born in a manger instead, and how the angels and the shepherds came to glorify that child. All of that happened 2,000 years ago, but they can tell that story by heart, just as well as any Christmas eve preacher ever could. They can tell that story, because someone told that story to them. And we can tell that story, because someone told that story to us. And someone told us that story, because someone, somewhere told it to them. It is a story that, though written down in this holy book, has its real power from being passed from person to person, generation after generation, Christmas after Christmas. Where did you hear the story first? Was it at church? Was it from a parent or grandparents? Was it from Linus at the end of a Charlie Brown Christmas? Wherever it was, you learned that story. And there’s something about that story that has brought you here tonight, to hear it, to tell it, to sing it, and to celebrate it once again. This December I’ve been thinking about the Christmas story a lot. I’ve been trying to remember how I first learned the story, and, really, I don’t know. My guess is that it wasn’t just one telling or one moment, but that slowly, year after year, I learned what Christmas was all about by watching the people around me show me what Christmas was all about. More than any other time of year, at our best, we become joyful people, hopeful people, loving people, peaceful people. We treat others a little better. We smile a little more readily. And we put lights on our houses and send out Christmas cards because we want to share that joy with others. But this year, maybe like many of you, I noticed something interesting. Certain talking heads on television are telling us that there is a “war on Christmas”. To hear them tell it, Christmas is undergoing a full-blown, devastating attack on every front. And as I’ve listened to people argue about whether the cashier at Target should be saying “Merry Christmas” or “Happy Holidays”, I’ve felt a little sad. Because in a season where we should be focused on the joy that Christ brings to us, we seem to be fixated on the idea that we need to defend Christmas. I don’t think that’s true. I don’t think Christmas needs defending. At least, I don’t think it needs defending against any outside influence. Because, I really believe that if there is a war on Christmas, it doesn’t happen out there somewhere. Rather, it happens in here. In our hearts. And it’s not just in December. It’s year round. I’ll tell you why. You might not know it, but though it is December, the new year is just getting started. That’s because while most of us turn over our calendar on January 1st, the church year starts instead on the first Sunday of Advent. That was back on December 1st this year. And on that day we start to prepare ourselves for Christmas. And just four weeks later, Christmas comes. And if you’re just looking at the calendar, you may think that means the year is almost done. But for Christians, it means the year is just beginning. 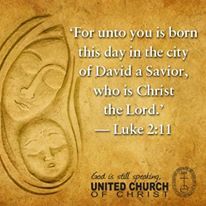 The birth of Christ is just the start of the story. It’s just the beginning of an incredible journey that lasts the entire year through. It’s the jumping off point. And all the things we feel in Christmas, the joy and hope and peace and love, aren’t supposed to slowly fade throughout the spring, and pop back up next December. They are supposed to grow and become more powerful throughout the year. This…this is just the start. And if on December 26th this feeling that you have in your heart is gone, then, yes, that war on Christmas was successful. Not the culture war that people talk about out there, but the struggle between choosing to live into the Christmas story that we all know not just a few weeks a year, but every day. What would it mean to tell that Christmas story every day? I’m not talking about with words. I’m talking about telling it with the way that we act, telling it with how we treat others, telling it with the joy that we give back to the world. What would it mean to not walk through life angry or stressed or fearful because things are changing, but instead filled with grace, filled with love, filled with hope? I believe that’s possible. I believe that God makes that possible. And I believe that God wants that for us. I believe that because I believe the story of Christmas is tells us that. When humanity had wandered so far away from love and light and grace, God didn’t just send us a message from afar. God became one of us. And Christ taught us how to treat one another, not so much through words, but through actions. And I think that’s how Christ wants us to tell the Christmas story now. Not by preaching it, not by arguing over who is giving us what holiday greeting, but by living it. By telling the world by our actions what it means that we are Christmas people. Tonight in Phoenix, on city streets, another UCC pastor I know is trying to tell the world this Christmas story. This Christmas he is preaching no so much by words, but by actions. He is bringing gifts of shoes and socks and soap and more to homeless and at risk youth who have been kicked out by their families. For many of them, he is the first adult that they’ve ever been able to trust. And through that trust, he is telling them the Christmas story. Tonight in Afghanistan, as troops come in from patrols, military chaplains are serving them coffee and a little bit of holiday cheer while they are so far from home. And there, in the most unlikely of places, through their hospitality and willingness to listen, they are telling the Christmas story. And tonight, in a small mountain town in Vermont, a sanctuary full of people are preparing to go back out into the cold night, after hearing the Christmas story, and make a decision about how to tell that story to the world for the next year. I love that carol. And I love the idea of going and telling this story. Go tell it on Mt. Snow. Go tell it at the top of Haystack. Go tell it on each one of the Green Mountains. But don’t stop there. Go and tell it in your homes. Go and tell it in your hometowns. Go and tell it in the highways and byways and everywhere you can think of. Go and tell it…Jesus Christ has been born in a manger, and that birth has changed everything for you. Go and tell the Christmas story all year round. Our best ‘draw’ when we proselytize is a life of joy and service. Folks are attracted to happiness. Just a little story: One Christmas Eve, I went to a Korean church with some friends and was delighted to sing “Go tell it on the mountain” with the congregation. As I sang in English and they sang in Korean, I began picking out Korean words that I understood! We all shook hands and beamed at each other afterwards. One of the deacons invited me to the post-service meal and we really had an amazing time.